Imagine Tallinn and a bearded Australian. 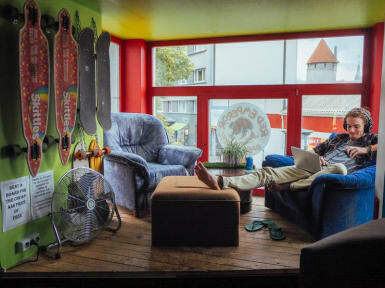 Imagine he creates a hostel with a community, an experience, and an atmosphere bursting with creativity, excitement and fun... Then imagine having a public bar attached to the hostel so you can socialize, drink on the cheap, meet locals as well as other travelers - open till down every day. Having the bar allows us to go out every night drinking, but also to keep the hostel quiet in the evenings offering you a range of different options and a great environment with chill areas if you want to stay in or go to bed early. We offer clean, bright spacious rooms, with hard to beat security and the real difference, attentive and caring staff who actually take an interest in all parts of your stay in Tallinn. We will make sure to show you cool underground places unseen on the common traveller's route and help you save money and have an authentic experience by recommending local places and tours, and using the specially negotiated deals for you. We also have a fully equipped kitchen for you to use, apart from the times when we are cooking up hostel dinners, breakfast of ham and eggs or whatever else we think the hostel needs to prepare for a good night out or to deal with a hangover! Given that we have our own bar, we only accept booking of individuals AGED OVER 18. Muito bom. O único problema são as janelas abertas no verão e o barulho que vem de fora em plena madrugada. Staff sensacional. Todos muito atenciosos. We arrived sooner than we thought and the staff were helpful and great :) The bathroom was very clean and they have enough showers, but I think the sheets were a little bit dirty and I felt cold inside the room (I couldn't tell if the heater were working properly), anyway we enjoyed the hostel and the trip. Wi-fi worked fine, the bar connected to the hostel did not bother us at night and you could wash your clothes for 5€ per load. Highly recommended! Really nice hostel. Great location, nice atmosphere, right in front of a supermarket. The place was clean and the kitchen facilities were great. There was a bar there with reasonable prices. Tiago from the reception was very helpful and always so nice. The only issue was that there weren't plugs by the bed and the lockers were in the common area. Very good place, cleaning and good atmosphere. It is a hostel just good for those looking for parties and bar! It is neither comfortable nor cozy! The room has dirty linen! If you want a towel, you have to pay for a bad and dirty towel! The bathroom looks more like a public bathroom! The water in the shower was chilly! traduzido pelo Eu acho que os clientes realmente aprecio sobre o nosso hostel é que nós oferecer uma experiência de comunidade, tanto para viajantes individuais e pequenos grupos. A nossa família internacional da equipe tem apenas um objetivo, para melhorar constantemente ou recursos e facilidades para nossos clientes! Dito isto, os nossos maiores ativos para ajudar a alcançar este objetivo tem de ser a nossa família de equipe e nossa localização imbatível aqui na bela cidade velha de Tallinn. Tendo viajado nós mesmos, ficamos e trabalhou em muitos hostels - que com certeza não haveria filas para os chuveiros, os colchões são confortáveis, os lençóis são bonitas e você tem tudo que você precisa a partir de computadores clientes para raladores de queijo. Nós também mudaram a festa fora de nossa sala comum e abriu Red Emperor Bar ao lado - para que você possa conhecer os moradores e os viajantes e pode ser sua escolha para ficar até tarde ou ter uma noite. As hospedeiras pessoal atividades diárias, como jantares albergue, noites de boliche, degustações de cerveja e até torneios pong da cerveja para fazer conhecer outros viajantes ainda mais fácil! Ha, e que é apenas no nosso albergue. Temos, então, um dos bares público de topo em Tallinn ao lado que hospeda noites de karaoke, pub quizzes, noites de microfone aberto e bandas ao vivo (internacionais e locais) na maioria dos fins! Temos também construiu uma rede com todos os passeios e atividades aqui, então você não precisa o aborrecimento de reserva coisas, você está de férias no final! Estes incluem passeios de um dia para o Parque Nacional Lahemaa, a prisão soviético velho assustador e da base naval velho em Paldiski e pub rastreia diariamente para citar alguns. Ou podemos dar-lhe um mapa, uma bicicleta ou skate e levá-lo para todos os lugares que arena't nos mapas turísticos!